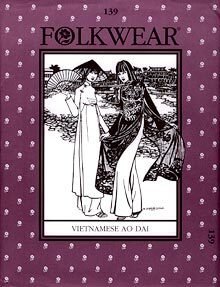 This feminine ensemble of flowing Tunic and wide-legged pants is considered to be the traditional costume of Vietnam. 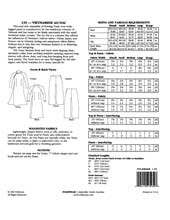 The easy-sew Tunic features front and back waist shaping darts, mandarin collar, front neckline/armhole opening, tapered long sleeves with elbow darts, and long free-hanging front and back panels. The Pants have an easy full-legged fit, center back zipper, and faced waistline. Misses Extra Small to Extra Large.